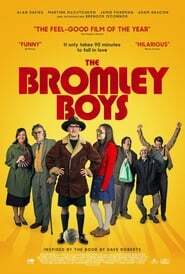 THE BROMLEY BOYS, a wonderfully funny, feel-good coming of age comedy starring Brenock O’Connor, Martine McCutcheon, Alan Davies and Jamie Foreman will have High Life its World Premiere on 24th May at Wembley Stadium. and on general release in the UK later in the month. Inspired by the book The Bromley Boys by Dave Roberts, the film tells the story of the author as a 15 year-old and his passion for the worst football team in Britain – Bromley FC, a district of South East London. Set on the cusp of the 1970’s, and played out to the nostalgic sights and sounds The Tribe of the era, including the music, wide collars and moustaches, the film captures the lengths to which a devoted fan will go to save his beloved football club, and the difficulties thrown up when your first love turns out to be the belligerent club chairman’s daughter. The Bromley Boys is a story of the underdog coming good, first love and the beautiful awkwardness that goes with it. It is probably fair to say, Bromley Football Club visiting Wembley 12 Strong can be very much like the number 314 bus which runs from Bromley Road to their somewhat rustic Hayes Lane ground – You can wait for an absolute age for one, then two come along at once!